Are you interested in how stereotypes are reproduced in the media? In exploring new, creative ways of writing? Join our New approaches on media production, journalism and storytelling course, starting end of February in Beirut. The course is offered as part of the newly established Alternative Academy, a joint Lebanon Support–Jibal initiative to offer scientific and other knowledge to everyone, and held over the course of seven weeks during spring, starting on 28 February and ending on 11 April. Each session is two hours, on Thursdays from 6 PM to 8 PM at Lebanon Support in Beirut. The course is open for anyone wanting to get a better understanding of stereotyping in the context of journalism and media, and find ways to do more just and equitable reporting. Participants will get the opportunity to locate and understand stereotypes and power dynamics, reflect on their own perspectives on privilege and/or oppression, look critically at media production and, through workshops on pitching and creative writing, explore new ways of telling stories. 1. 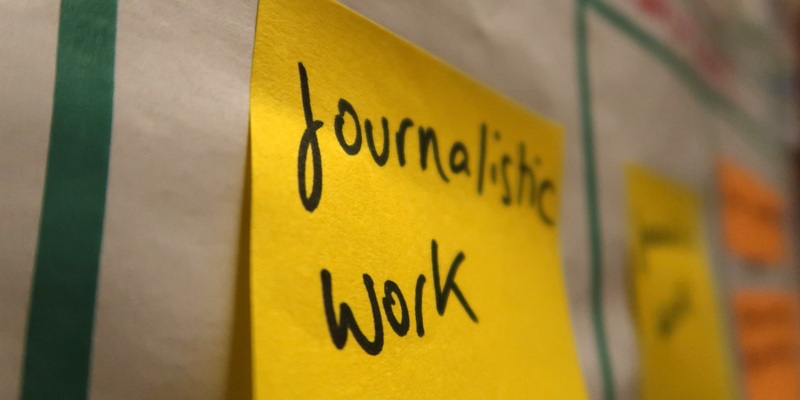 Why rethink how we do journalism? This session introduces the course and lets participants set their own goals for the entire seven-session programme. We look at one recent example of media reporting on development/migration and open up for a discussion of what kind of media coverage we see today – and how to make it more diverse, just and reflecting of different perspectives. You will also get assigned the task to work on a specific story throughout the course. This session introduces the concepts of stereotypes and power dynamics, and looks at how the stories we produce can be used to empower and humanise instead of dispossess and malign. This session gives the opportunity to use concepts and ideas introduced during the discussion on stereotypes and ’single stories’. We look back and reflect on things we have reported on previously, in order to find concrete ways to do more diverse and equitable journalism. Things to be discussed include: how do we find people to interview, how do we search for new ideas and research our stories, and how do we approach and write about issues. This session builds on what has been discussed so far, and continues to develop the concepts of privileges and power dynamics. It will enable the students to better situate themselves as authors and producers of knowledge, and become aware of the impact they have on their audience. With specific tools, participants will be able to reflect on their previous work and build more critical thinking when it comes to social justice and recognition of minorities. All throughout the course, participants have been working on producing articles or other forms of stories, in order to apply the learning in a direct and concrete way. This last session serves as an opportunity to reflect on the approach used in the course and share our work amongst each other. Jenny Gustafsson is a journalist/writer and political scientist born in Sweden and living in Lebanon since 2009. She has reported from across the Middle East, South Asia and elsewhere, including Bangladesh, Honduras, Guatemala, Sri Lanka, Libya, Algeria, Tajikistan, India and Saudi Arabia. Her work often focuses on migration, development and other issues related to society, or craft traditions and heritage. Her work has been featured in outlets including The Guardian, Foreign Policy and Al Jazeera. In 2010, she co-founded Mashallah News, an online platform on social issues and urban life across the Middle East, and she has been part of several cross-border projects on journalism and storytelling. She has worked with organising and facilitating workshops on journalism and the deconstruction of stereotypes for several years. Ibrahim Nehme is the founder and editor-in-chief of The Outpost magazine. His work in exploring the possibilities of journalism and storytelling has been of international success, with The Outpost being referred to as ‘a successor to the Economist’ by The Guardian and harvesting top awards in print, journalism and cultural action. He founded Radio Mansion, a community radio experiment that was launched in Beirut in June 2018. He is also the founding creative director of ‘a Dance Mag’, a global dance publication based in Beirut. He is interested in building storytelling platforms that challenge mainstream cultural discourses and create space for alternative narratives to break through. Ibrahim has over 12 years of writing, editing and journalistic experience. He occasionally gives talks on how creative storytelling can lead to social transformation. Angela Saade is a co-founder of the Lebanese NGO Jibal and the French NGO Tabadol, both working on how to build intercultural and diverse societies with equity and social justice at the centre. She has developed several projects, including trainings for youth, teachers and journalists on topics related to stereotypes, power dynamics and migration. Throughout her ten years of work on these topics, she has developed a hands-on experience that enabled her to build strong knowledge and approaches for training and reflecting. Angela has also worked as a technical advisor for the youth program of the Lebanese organisation Mouvement Social. She holds a masters degree in applied anthropology and one in engineering. She has experienced exile on a personal level, first when she left with her family during the Lebanese war, and then when she migrated to France for her studies. This has put her in a first hand position to analyse the subject of migration and power dynamics in relation to it. This course is open to journalists, people working on communication with NGOs, people working with media, writers, film makers, bloggers, social media influencers and people who make podcasts and radios shows. Each Thursday from 6 PM to 8 PM from February 28 to April 11. The reduced fee is offered to people who have salaries under 1,000$/month but still pay rent monthly. If you don’t fall under this category and still would like to pay the reduced fee, please contact us. This rate is applicable for a limited number of participants. The solidarity fee is an optional choice for anyone who has the economic means and ability to pay a higher rate and want to make it possible to offer this course for a reduced rate to participants who have limited economic means. The main language used will be English.